The Purple Pug is celebrating a huge milestone, as any minute now she will reach 8,888 Facebook Fans! And what better way to celebrate than with 88 bloggers plus 8 sponsors giving away CASH to one of our readers? Well, I'll tell you what's better... giving away cash to FIVE of our readers and also to a very deserving charity. 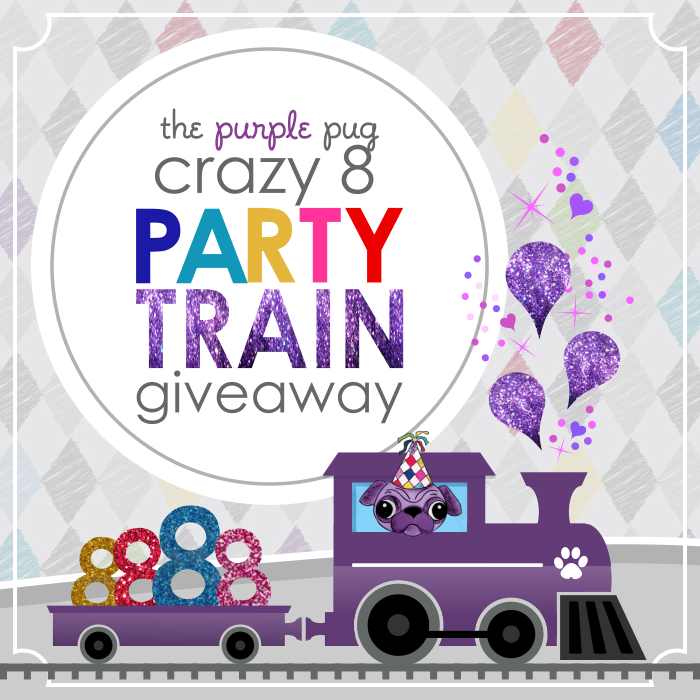 Hop aboard The Purple Pug Crazy 8 Party Train Giveaway! Two very lucky winners will win $888 CASH, EACH! Three lucky winners will win $88 CASH, each! And a very deserving charity, Project Night Night, will be given $888 as well. Project Night Night helps homeless children have sweeter dreams by donating over 25,000 Night Night Packages each year, free of charge, to homeless children who need our childhood essentials to feel secure, cozy, ready to learn, and significant. So what are you waiting for? Enter to win the cash below!! And be sure to stop by The Purple Pug and enjoy all of the glittery eye candy she creates. She is truly one of the very nicest people ever and I'm thrilled to be a teeny tiny part of her celebration! Important details: The Giveaway is open WORLDWIDE. Entrants MUST have a PayPal account as that is how we will distribute winning funds. Winners will be chosen randomly via Rafflecopter and validated before they are notified. All prizes will paid in USD. All prizes must be claimed within 48 hours or another winner will be chosen. I wished and I "glittered". Honest. Thanks so much! Glitter Glitter Glitter!!! I really hope I win,, I need that money so much right now!! Thank you very much!